They’re flavorful. I tried both kinds, the Multi-Grain ones and the Italian Tomato & Herb ones, and I was happy with each of them. The best way to describe the Multi-Grain ones is that they look and taste sort of like Wheat Thins. (My husband tried one and thought the same thing.) They have a wheaty, almost salty flavor; they don’t taste bland and cardboard-like, as some grainy, healthy crackers or flatbreads do. I should mention that the crackers don’t taste anything like Special K cereal, if that’s what you were expecting. They don’t have that rice base the cereal does; they are made with whole wheat flour. They come in satisfying 90-calorie packs.Both flavors come in regular 8-oz boxes or 90-calorie packs. I like the packs because you get 17 crackers for 90 calories (and only 2 grams of fat), which is a really decent amount of crackers for such few calories and low fat! My hunger was actually satisfied after I ate one pack. Other brands of portion-controlled or healthy crackers are more caloric. For example, Wheat Thinshave100 calories per pack—okay, not that many more calories, but every bit adds up if you’re watching your weight. Kashi’s TLC Fire Roasted Vegetable Crackers are also more caloric, at 15 crackers for 130 calories (though I’m not sure of the cracker size difference). 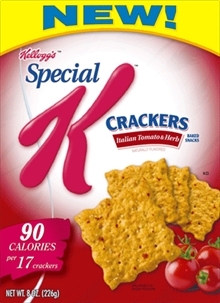 The Special K ones make me happy because I like being able to munch on a larger number of items for fewer calories. Isn’t it disappointing when you buy crackers or chips and you can only eat three or four of them before reaching 100 or 200 calories? I’d usually rather buy food that I can eat more of for fewer calories. Makes munching more fun! Sometimes you want to pop a lot of food into your mouth and keep eating without having to think so hard. They do have a fair number of ingredients, so even though they’re low in calories, they’re probably not as good for your body as all-natural or organic crackers like Barbara’s or Annie’s. The crackers are small, so they’re good for munching on by the handful, but they’re not really a cheese-and-crackers kind of cracker (cheese wouldn’t fit on them very well, and the taste might not go). This is not a criticism, more of a warning, so you don’t buy them for that purpose. They’re meant to be more of a personal snacking cracker, not an entertaining cracker like Carr’s. But if you really don’t want to eat them plain, they would work well with dipping—the Multi-Grain ones would work nicely in hummus or babaganoush, and the Italian Tomato & Herb ones would probably go with a cheese dip, like Boursin Light Garlic & Herbs.